Celebrating Ted Campbell for distinguished service, organizing for 2017-2020, welcoming new board members, and blessing Bishop Jeremiah Park as he set off on a special mission to Mongolia highlighted the first meeting of the new four-year cycle for the General Commission on Archives & History (GCAH). 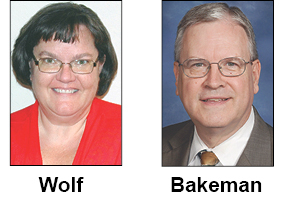 Two Oklahomans serve on this denomination board: Christina Wolf and Brian Bakeman. Wolf also is the archivist for the Oklahoma Area, and Rev. Bakeman is new executive director for the South Central Jurisdiction. Bishop Park is president of the 24-member commission. The group met recently at the United Methodist Archives & History Center on the Drew University campus, Madison, N.J.
Dr. Campbell said, "People become disciples of Jesus Christ because of story, whether from the Bible, the early church, Christian history, congregational histories, or personal accounts. People become involved in a particular church and develop loyalty because of that church’s story — its DNA and unique personality." "I like the way an attendee to our Archivists Training Event put it," said General Secretary Alfred Day. "GCAH is more about STORies than STORage." Day also spoke about the board’s mandate as the Church’s "ministry of memory." "Memory in the Commission’s work is not meant in the passive but the active tense. Our promoting and caring for the historical interests of the UMC and its antecedents is vital, difference-making memory. Transformational." A visioning time stressed initiatives. • Increase digitization and online accessibility of resources. • Expand efforts to train archivists, especially in Africa and the Philippines. • Seek creative ways to translate the UMC’s history at every level of church life. The commission also approved a new award for children and youth curriculum about United Methodist history and set themes for the annual observance of Heritage Sunday. The 2017 theme is "Milestones – Encouraging Local Church History Celebrations." You can reach Oklahoma’s archivist at cwolf@okcu.edu or 405-208-5919.